Rakusan did not include the Fan Series in his main sequence numbering. Therefore, the original number used for each of the 36 Series prints has been modified to identify the Fan Series members of its theme. The five different fan silhouette shapes have been here assigned arbitrary numbers 1 through 5. To indicate a fan design these shape designations are added to the 36 Series number separated by a hyphen. 127-2 is the Fan Series design with fan shape 2 in the 127 Shrimp and Clam theme. Like all other designs in this series, 127-2 was only produced in a single print run, and few copies are currently documented. Three of the five fan designs (including 127-2) have seal C which indicates a carving date during the first half of 1934. Despite the early completion of those wooden blocks, Rakusan delayed printing and distribution of the prints in what became the 127 Shrimp and Clam theme at least for several months. It was eventually grouped with other winter season themes nearer to the end of the series. One fan design (127-3) has seal R which is a rare minor seal whose carving period has yet to be established. The remaining fan design (127-5) and the 36 Series design 127 both have seal B which indicates a later carving period closer to the time of publication. 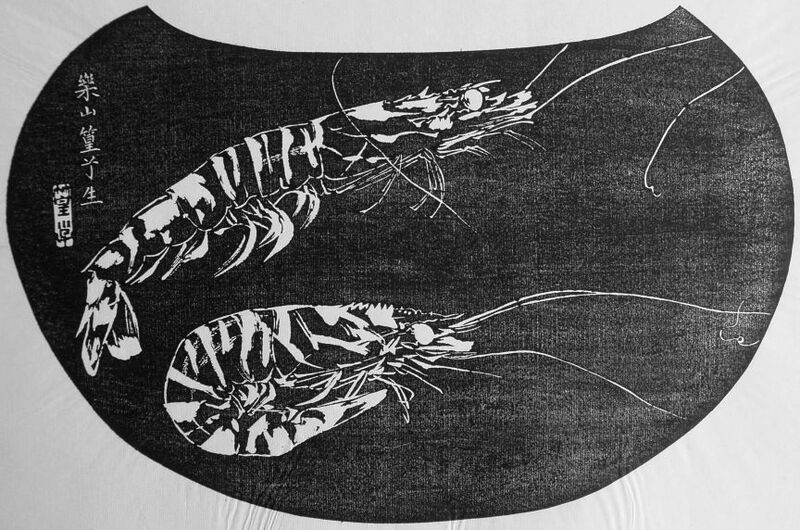 The composition of 127-2 includes only two large prawns viewed from the side. Since there is no obvious background, the arrangement could be a studio still-life or a view into an aquarium. The animals are rendered as essentially line drawings which look equally well in the ishizuri version or in the original sketch. 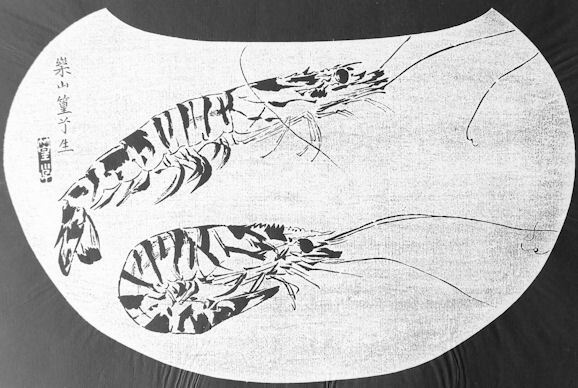 Giant Tiger Prawn (Black Tiger Prawn, Asian Tiger Shrimp), Penaeus monodon, 牛海老, うしえび, ウシエビ, ushi ebi, lit. 'cow shrimp', is an economically important marine crustacean which is widely farmed for food. Another Japanese name is ブラックタイガー, burakku-taigaa, from English 'black tiger'.